KREYOL: Haitien frè m yo... Gade eta yon route nan nan yon peyi pandan politicien ap woule bel Toyota Land Cruiser Prado yo, y ap pale tout vye koze eksepte sa k ap itil peyi a... Pandan se tan, sitwayen andeyò yo riske pran MALARIA, DYARE, la Fièvre Typhoïde, PIKAN anba Pye, nan route pou y al lakay yo... Ou wè lobey? Kisa ou panse de sa??? 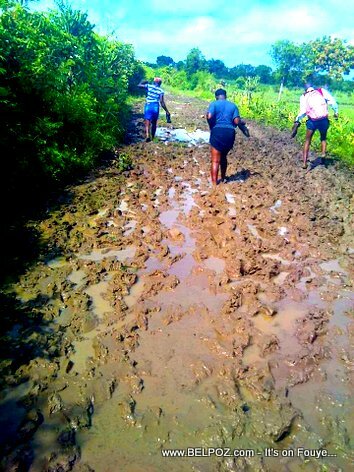 The plight of the inhabitants of the second communal section of La Belle-Mere, town of Pignon, continues because of sanitation problems that cause difficulties for the movement of motorists, pedestrians and a resurgence of cases of typhoid and diarrhea. Out of all the communal sections depending on the town of Pignon, La Belle-Mere is the section that now poses more problems in terms of hygiene and sanitation, the consequences of uncontrolled urbanization. Since the approach of the rainy and hurricane season, many residents of this section complained about the poor condition of roads, with all the inconveniences they they are facing in order to get around. Because of the large sanitation problems in the city especially in the section of La Belle-Mere, many streets in the city, remain for flooded for hours by runoff rain water, making driving difficult, especially for motorcycles and pedestrians often splashed by motorists. These people complain the mayor and the Ministry of Public Works (MTPTC) have done nothing to improve their living condition. These people are elected to do WHAT exactly?? ?